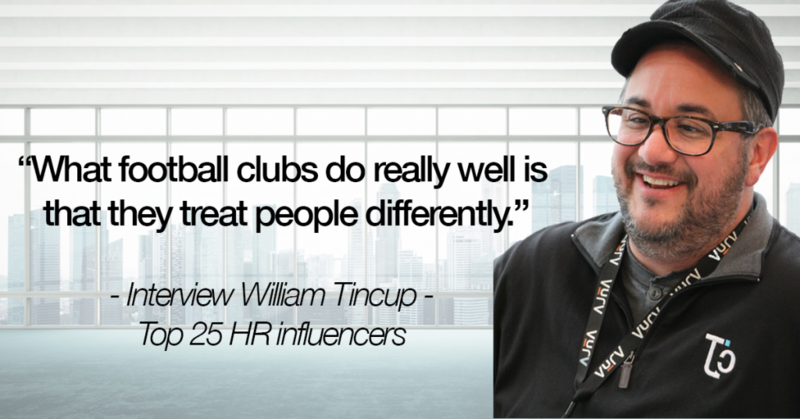 In this interview, William Tincup shares his thoughts on the current and future state of HR and employee appreciation. A curious soul, an easy-going conversation and a bunch of thoughts on employee appreciation best practices.William is the President of RecruitingDaily . At the intersection of HR and technology, he’s a Writer, Speaker, Advisor, Consultant, Investor, Storyteller & Teacher. He’s been writing about HR related issues for over a decade. William serves on the Board of Advisors / Board of Directors for 18 HR technology startups1. William is a graduate of the University of Alabama of Birmingham with a BA in Art History. He also earned an MA in American Indian Studies from the University of Arizona and an MBA from Case Western Reserve University. For the few that might never heard about you, how would you pitch yourself? I think I’m just a curious soul. The way I came into HR is pretty interesting, I came from marketing. I owned an ad agency and a part of my role as the owner was to deal with talent, meaning payroll, benefits, internship programs, mentorship programs and kind of all the different pieces of H.R. Being a non traditional practitioner of recruiting and H.R. the more I was dealing with this kind of tasks the more curious I was getting about H.R. By the time I decided to sold the equity I owned at the marketing agency I was already obsessed about what’s best, what works, what doesn’t and specially the intersection with technology. Finding and learning how technology may help us, fulfills our hopes and dreams; it’s what makes me wake up more curious everyday. Do you agree that we are moving one step further from the concept employee engagement into something broader called employee experience? How does this unfolds within the companies? Yeah there’s a couple things that I really like regarding that evolution. One is related with the fact that people already started to understand that engagement benefits everybody , it’s in everyone best interests. It’s in our best interests as employees, as leaders, etc. We all want to be engaged, we all want to be in environments where we’re engaged and we also want to engage others. From a company’s perspective why doing it? Well, companies do it for a couple reasons, they do it to get more out of people, to get people’s discretionary effort. How do you get people to work beyond what they’re willing to work? They have to be engaged , no one’s going to do more work for the same amount of money or less if they’re not engaged through something that goes beyond money. Engagement is like recycling . We all know we should focus on engaging people. There’s loads of research studies that show that more engagement leads to more production and therefore with engaged employees you’ll get better results. So we know it’s a good thing, we all agree it’s a good thing however the fall down or the discrepancy is related with how do you do it? What’s the practical applications of engagement? What’s best for one company might not be the best for another company. The way we think of engagement is more or less something that changes as it relates to the employees, the managers, the company, the values, the market, the competition and we shouldn’t think one fits all. Like a lot people look at Zappos and say they have a wonderful culture, they look at Amazon and say they have a bad culture. What’s lost in that is that there isn’t good and bad. I mean typically there are some things that are despicable and not despicable but not, good and bad. Amazon’s culture focus on people being intelligent, working hard, in the end a meritocracy oriented culture and so their systems of engagement needs to be different then a company like Zappos. It doesn’t mean they are either good or bad it just means that they fit the people that want to work there and so I think what I like about you kind of moving us over to employee experience rather than engagement is that the first encompasses the notion that you and me can walk into the same bit and have a different experience. I like the idea of thinking about experience because there’s the user experience, the customer experience, the employee experience, it’s a journey, it’s what you want people feel, taste, smell and so companies should think about that in order to create it for people. Should companies invest as much as satisfying customers as having happy employees? Well if you’re a consumer brand like Nike, employees are customers as well, so they’re actually literally. Now b2b it’s a little bit harder, products or government or something like that it’s a little bit harder. I think it’s the treatment and let’s just put cost aside for a moment and think about how do you, as a company want to treat people. What are your values, as a company you have shared values and that’s top to bottom, that’s left or right that’s everybody. How do you want to treat people ? What’s the treatment of your customers? Do you want to make them feel special ? Do you want them to feel like raving fans? Do you want to engage them in a way that makes them tell about you to other people in a good way. If that’s true then you spend money to help programmatically get that outcome then why wouldn’t you look at employees like that ? Everyone has a Twitter account everyone’s on Facebook everyone has a cell phone or a smartphone and they can text a thousand people at once. We’re to the point now where every single person has their own megaphone and so we treat customers because we want them to have a good experience, but if we treat them in one way at the exclusion of the employees then we’re failing. It’s a commonly accepted fact that performance reviews currently do not work. What is the main reason behind that ? First of all in recruiting you have a romance period, we find talent, we romance and we get all the way to a point where we drop them off to be on boarded and it’s a soulless windowless take on the job and task at hands. We kind of hope that it works out for people and at one point we then give them a performance review and in that performance review what we give them are advices that are best for us. Performance management has always struggled and possibly will always struggle with whose interest is being served with performance management. I mean are you giving the employee advices for his benefit or are those for the company’s benefit. We like to think that it’s for both. I want the employee to be better and the company as well but what if I have to give the employee an advice that’s actually counter to the company’s interests. Do I as a leader should give him that advice? Imagine this situation: I’ve seen that employee grow, he’s doing awesome but really what he needs is that next step, an international experience. However our company doesn’t have any of that and we’re not going to have any for a while and it’s in employee’s best interest that I tell him: hey you should really take another job potentially outside of this company so that you can get this international experience and you’re better. Now, would I ever give you that advice? And that’s the struggle of performance management, one of the many struggles of performance measurement is whose interest does it serve? Does it serve the company’s interest or does it serve the individual’s interests? And there’s a few examples from in the marketplace where companies actually give the employee career path advice which is just for the employee and not really tethered to the company. However, most of the performance management systems that you see out there today, they serve the company’s interests and that’s what they are created for. That’s not necessarily a bad thing. The problem is employers think that they’re doing employees a favor by giving them performance management, but even though it’s only in the company’s best interests they couch it in like: “no this is going to help you”. Well let’s stop lying about that, my opinion is let’s just stop let’s let that go and tell people: “hey this actually for us so that we do better so that we make sure that we’re on the right track and we get the most out of you because we want the best version of you while you’re with us. We’re going to train you we’re going to help you, we’re going to throw some stuff in but at the end of the day we want the best version of you while you’re with us , and that should be ok.
Managers just should be straight up front with people when doing performance reviews. So you wouldn’t agree Millennials are one of the reasons why performance reviews stopped working? No, I actually don’t blame Millennials I think this would have happened no matter what. I think this is just where we are in society that we’re in this era of transparency and I think that this would have happened regardless of being the millennials, generation X, baby boomers or whatever. So I think it’s just more of where we are as a society than it is about one particular generation or another. Intelligence is a buzzword in HR. In your opinion Where does intelligence stand regarding HR and recruiting? First of all you should map it back to what’s important to the company . There are several ways people can be “intelligent”. You can strive in emotional intelligence or you know there’s personality and so I kind of look at all of those different things in spokes not the wheel and so what are the spokes that are important to the company? The values of the company, the trajectory, the mission, the vision, all of those things. What’s really important to the company? And then how do those things align with what the companies got going. So to put that in kind of a real world example, one of the the key cornerstones of emotional intelligence is empathy. Let’s say that a part of our company mission was to reduce homelessness in the world, having people that aren’t empathetic on staff is counter to the interest of the whole mission of the firm. So you kind of see how it dovetails like the mission set forth where we want to go what’s true north and if you don’t have the people with the right tool set that can help you get there, you won’t get there. If we hired 100 really great people but they’re all lacking in empathy or really low scores of empathy, we’re not going to get there as there’s no way we can reach our goals with that team. It’s like having Champions League aspirations and not the roster or the talent or the payroll to support that. So you set the dream, you set that vision first and you back fill it with the right people with the right skill set. I think that I would look at what’s the purpose of the company, what’s the mission, vision, values, where we want go and then it’s sort of how do we staff this with the people the most competent the most passionate about what we’re doing and by the way the most competent and I would put emotional intelligence in there as a factor of competence not that one is more competent than the other one just more appropriate for the use than the other. Speaking about intelligence, and being you at the intersection of technology and HR, how do you look to Artificial intelligence, machine learning, etc ? Machine learning , AI and so on are tools that speak for the data. Up till now, we’ve not had the expectation that databases or data would inform us. Now what you’re seeing, even though at very early stages, is the expectation of having data tell us something. I think we’re really living in a interesting time because, we expect, the practitioners expect, the vendors expect, the investment community expects that it’s not just about dumb databases, data has to tell you something and you and I are going to live through a phase where insights that used to be remarkable are going to become commonplace, a commodity. Everyone’s going to have access to similarly intelligent tools that will provide similar insights. The bigger question is, what will you do with it? How do you turn it into action? So artificial intelligence in a near future will not only give you insights but also a rational decision of what you should do so that insights become action. Currently, people are throwing a lot of stuff against the wall to see what sticks but you and I are going to see it play out. Expectations are completely changed and what people are willing to take and pay for is going to change as well. Insights are not going to be near as important as insights that lead to action. If you ask me, do I think that’s going to happen over one year or ten years? I have no idea there’s no way to know and so that’s the fun and fantastic phase where every time we wake up something completely new is being delivered. What do you think companies can do to tackle the different needs every employee has? Can you give me any actionable tip managers, companies and HR staff can actually do to keep them engaged, motivated and therefore perform at their peak? Here’s the hard thing, standards are our biggest enemy and it’s going to sound hard to say, because we’ve fallen in love with standards and the thing is that one of the premises of standards is that you should treat everyone the same, it’s just like cookie cutters, everybody gets to same treatment . It’s like a shortcut for our brain. We rely on standards because it’s easier thinking that everyone needs the same but we know in our hearts that it isn’t like that. So you take a football example like Real Madrid or Barcelona. Imagine one of those players that are world class hall of famers, with the likes of a Messi or Ronaldo. The point is those guys are so special and so unique and so good and gifted and talented. Can you imagine treating them the exact same way you would treat a seventeen year old that’s on the reserves? Well, you’d never do it. You’d never say to Ronaldo: look I’m gonna put you in the same hotel I’m going to give you the exact same bus service and whole the same treatment as a 17 years old reserve? No, hell no! There’s no way you do that right? So imagine if we were running this as if we were running a football club and I think it’s actually really good to think of talent like that because what football clubs do really well is that they treat people differently. They know exactly what each guy needs and they give them that. You need more training, you need to spend more time with a goalie, you need to do this we’re gonna do that. If they need a private plane, a special car or anything else their “Manager” is going to provide. They give each guy on the squad exactly what they need, no more no less. They don’t give him extra stuff they don’t malfit him in any way they don’t treat him like cookie cutters they don’t do any of that stuff, they treat him uniquely as they should and as different people. I think we’ve hidden from that, we’ve run from that and we’ve latched on to standards far too long. If you look at the most successful companies in the world currently it’s easy to notice that those companies are the ones that know better their customers, look at Google, Faceboook and so on. They perform so well because they do their best to personalize the experience for each single customer. They understand people are different and have different needs so they do their best to know each customer and therefore provide the most personalised experience possible. In the end their competitive advantage is related with having much more data about people than any other company. What’s funny about that is that it’s a part of every manager, HR staff role to be in tune and learn about what employees need and provide, that’s the game .I need to be great at kind of putting my ear to the ground and listening to what they need and then turn around providing what they need. A recent study showed that more than 15% of employees don’t see themselves working at their current company one year from now. Should we look at this as a problem or market evolution? If you consider it a problem do you find it company’s or employee’s fault? Here’s the deal, you want the best version of an employee while he’s with you and so if you know he’s only going to stay 1 year it’s up to you to change that. So you need to ask yourself what can you do as a leader, as a manager or as a company to keep that person interested? There’s always ways you can keep them longer if you want to. The reason we have those stats is because we’re not doing stuff to make people feel special and to stay , we are not giving them a legitimate reason to stay and if we did that if we gave them a legitimate reason to stay guess what they do? They would stay. So we shouldn’t blame the Millennials or any other generation because it’s not their fault, if you feel like the company has given up or doesn’t care about you it’s time to move on. I always used to tell my wife when she was working to corporate America: t he moment you stop learning is the moment you should look for another job , that’s the very moment to jump out of the boat, it’s the very moment you say: yeah I’ll go do something else. Well the fact you’re not learning is both your responsibility and the company’s responsibility. If the company’s not providing those opportunities and not building your skills and not caring enough to help you training and build your skill set that may get you to that next place, then why stay? It’s like staying in an unfulfilled marriage, well would you stay? Go do something else! Life’s too short! I don’t blame a generation I think it’s really kind of comes down to the companies, they’ve got to think if they want to keep this talent, they need to be aggressive on their side and you know what? if it doesn’t work that it doesn’t work but at least the company tried. A founder of a SMB company that can’t afford any HR Staff comes to you looking for advices because he’s struggling to keep his team motivated and focused on growing the company. What’s the best advice you would give him? The best advice I’d give a guy in that stage, which is really pretty much anybody in the world that’s going through growth is, don’t get out in front of your skis, grow fast but grow the right way. I learned this actually ironically enough by a phrase that came out of Liverpool Football Club and what I liked about is the fact that underlines the fact that it’s actually not just about winning , and specially in football and the sports that we love, it’s not just about winning it’s how you go about your winning . If you win and you’re a jerk or people don’t like you and your kind of throwing at people’s face and people are not rooting for you, but they’re really against you, then was winning worth it? My best advice, I’ve been given from the triathlons guys on the swimming side, they used to say: you should “go slow to go fast” and so the whole goal when you’re swimming on that part of the the triathlon is that you think about your fundamentals : your stroke, your breathing, little things. You should not think either about the guys in front, or the guys behind you. When you’re just thinking about the fundamentals you slow things down and avoid wasting energies on distractions. The same should happen in the business world. If you’re running lean with no money to afford someone with HR knowledge go back to the basics. It’s people you’re managing, PEOPLE, the same species as you are. So hear them, understand what drives them and meet their needs. So for all the entrepreneurs, my best advice is Grow, comma grow the right way!